California's marine sanctuaries protect ocean animals from fishing, underwater mining, and drilling. 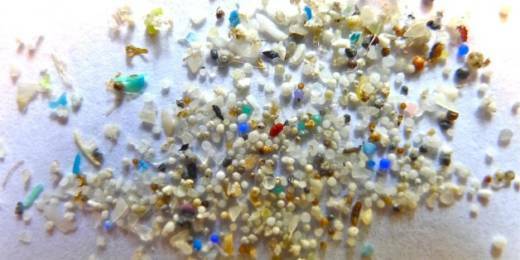 Yet scientists think a more insidious agent may be contaminating their territory: microplastics. Microplastics include both microbeads—tiny plastic beads used as exfoliants in healthcare products—and minuscule synthetic fibers from clothing that are smaller than 5 millimeters. Two years ago, Congress and the California legislature passed laws banning the sale of cosmetic products that contain microbeads. But the state ban doesn't take effect until 2020. And the federal ban, which covers all states including California, doesn't take full effect until July 1, 2018. So these microplastics, which are too small for water systems to catch, have continued to flow straight into San Francisco Bay. "It's kind of a disaster," says Carolynn Box, science programs director with 5 Gyres, a non-profit funding ocean trash research. A pilot study last year, conducted as part of the SF Bay Microplastic Project, found that wastewater treatment plants were discharging 7,000,000 particles each day into the San Francisco Bay. 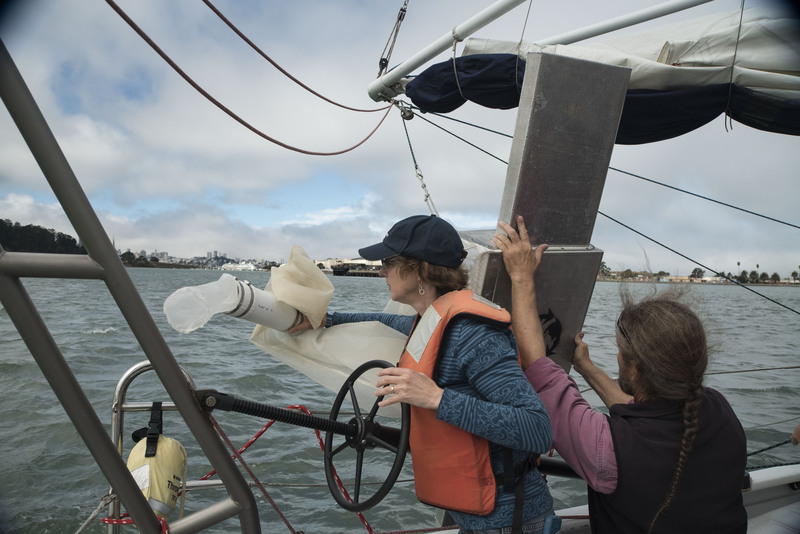 The sheer load of these particles, both plastics and non-plastics, "suggested that San Francisco Bay has more microplastic pollution than other major water bodies in the U.S.," the study said. The next phase of the Microplastic Project is to make a more conclusive measurement of how much microplastic is in the Bay and where it travels. "We honestly don't know where they're going," says Meg Sedlak, a senior program manager with the San Francisco Estuary Institute. "We aspire to address that with our modeling." The Institute is a nonprofit research center focused on the Bay, Delta and wetlands. This week, Sedlak and her team, along with 5 Gyres, used a large trawl fitted with a net to collect surface water near the Bay Bridge. 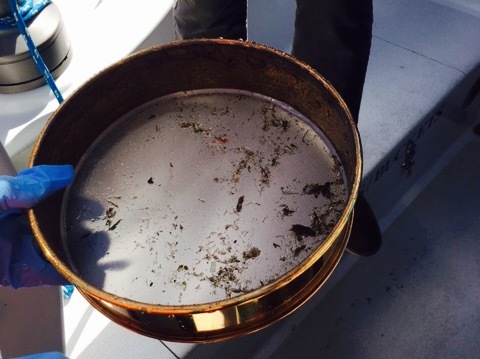 The sample contained clumps of eel grass and small bits of debris, which will be sent to a University of Toronto lab for analysis. The crew also dropped a sensor into the water to measure ocean currents to figure out where the debris might be traveling. The researchers suspect particles are drifting into Northern California's three national marine sanctuaries and could be affecting marine life there. They tested Greater Farallones and Cordell Bank this summer and will test Monterey Bay National Marine Sanctuary in October. Scientists still don't know where 99 percent of all trash flowing into the ocean is going. Less than 1 percent ends up in large swirling ocean currents called gyres, which include the Great Pacific Garbage Patch. Some marine debris, especially derelict fishing gear, can be removed, but microplastics are much too small to clean up. That's a problem because plastic absorbs toxic chemicals like a sponge. Studies show harmful chemicals attached to plastic are moving up the food chain. "There is a significant amount of trash being found in fish around the world," says Box. That could affect human health if people are eating those fish. In a new study by Vancouver Island University, students planted clams and oysters along the coast of British Columbia, tested them three months later, and found they contained tiny plastic particles. California scientists will get results, including a chemical analysis of microscopic particles from the Bay, next summer. Before then, they'll sample a total of 16 sites inside San Francisco Bay and 12 sites inside Cordell Bank, Greater Farallones and Monterey Bay National Marine Sanctuaries. They'll collect debris after extreme tide events and heavy winter rains this year, in an effort to determine how the plastic pieces are moving between the Bay and the Pacific Ocean. Sedlak says, fortunately, the public is more clued-in to microplastics than they were 30 years ago. "By informing people about plastics getting into the ocean—like we saw with the ban—we can see a difference," says Sedlak. "I'm hopeful."